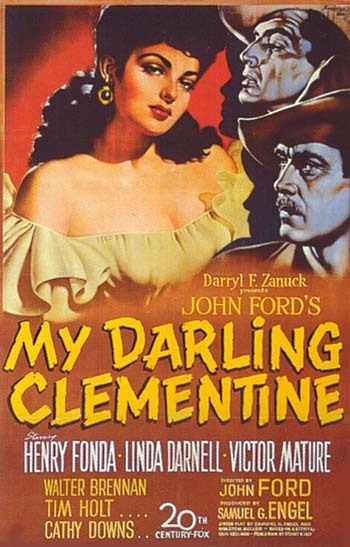 My Darling Clementine, a 1946 film regarded as one of the best Western movies made by director John Ford, stars Henry Fonda as Wyatt Earp during the period leading up to the gunfight at the OK Corral. The ensemble cast also features Linda Darnell, Victor Mature, Walter Brennan, Tim Holt, and Ward Bond. 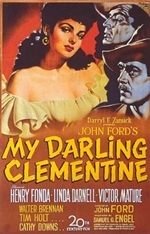 The title of the movie is borrowed from the theme song "Oh My Darling, Clementine", sung in parts over the opening and closing credits. The screenplay is based on the fictionalized biography Wyatt Earp: Frontier Marshal by Stuart Lake, as were two earlier movies, both named Frontier Marshal (released in 1934 and 1939, respectively). The film is generally regarded as one of the best Westerns made by John Ford and one of his best films overall. In 1991, the film was deemed "culturally, historically, or aesthetically significant" by the Library of Congress and selected for preservation in the United States National Film Registry; it is among the first 75 films entered into the registry. Fifty years after its release, Roger Ebert reviewed the film and included it in his list of The Great Movies. Director Sam Peckinpah considered My Darling Clementine his favorite Western, and paid homage to it in several of his Westerns, including Major Dundee (1965) and The Wild Bunch (1969).